(from page 3 of the 1969 Collection) Raven Black 1969 Mustang Mach 1 with a 335 hp (at 5200 rpm), 428 cubic inch, and a Cobra Jet V8 with a Holly 4 barrel carburetor. (from page 4 of the 1969 Collection) Raven Black 1969 Mustang Mach 1, front end view. (from page 4 of the 1969 Collection) Right rear view of the Raven Black 1969 Mustang Mach 1. (from page 20 of the 1969 Collection) An incredibly well restored Raven Black 1969 Mustang Mach 1 fastback with a matte blacked out hood; hood scoop; hood pins; front air dam; rear spoiler; Mach 1 side stripes and lettering; Magnum 500 wheels; and a 351 cubic inch, 2 barrel, V8 engine. (from page 20 of the 1969 Collection) Raven Black 1969 Mustang Mach 1 fastback, rear left view with a matte black rear spoiler and red Mach 1 side and rear stripes. (from page 20 of the 1969 Collection) Front view of a Raven Black 1969 Mustang Mach 1 fastback with an offset tri-bar pony grille emblem which was the standard for 1969. A matte black hood was a standard option included in the popular 1969 Mach 1 options package. (from page 20 of the 1969 Collection) Left side view of a 1969 Mustang Mach 1 fastback in Raven Black paint, red Mach 1 stripes, and Magnum 500 wheels. (from page 20 of the 1969 Collection) 1969 Raven Black Mustang Mach 1 fastback, rear right view. 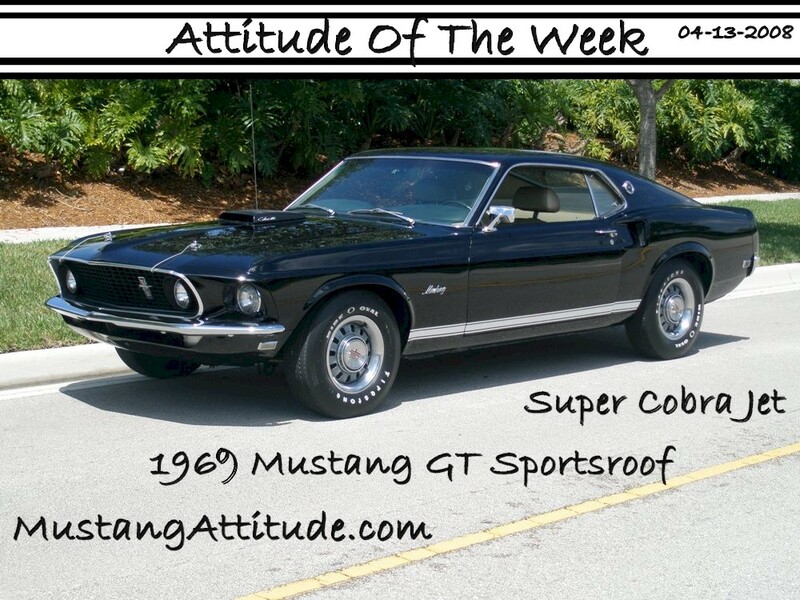 (from page 23 of the 1969 Collection) This Raven Black 1969 Mustang GT sportsroof/fastback with a 360hp (at 5400rpm), 428 cubic inch, 4 barrel, super cobra jet, ram air, V8 was our Attitude Of The Week for 04-13-2008. This car has the optional GT equipment group which consists of rocker panel GT stripes, GT gas cap, GT hubcaps on argent styled steel wheels, hood pins, simulated or functional hood scoop, and chrome quad outlets depending on the engine ordered. With the 428 Super Cobra Jet upgrade came the Drag Pack which included an external oil cooler mounted in front of the radiator. This photo is also available as a 1000 by 750 pixel wallpaper. (from page 23 of the 1969 Collection) Raven Black 1969 Mustang GT fastback, left side view. This photo shows off the 1969 newly designed fastback 2+2 body style sometimes called the sportsroof. Also check out those GT argent styled steel wheels. (from page 23 of the 1969 Collection) Rear left view of a Raven Black 1969 Mustang GT fastback. (from page 23 of the 1969 Collection) 1969 Raven Black Mustang GT fastback, rear right view. You can just make out the GT gas cap in this photo. It has the same raised red letters as the GT wheel covers. (from page 23 of the 1969 Collection) Right side view of a 1969 Mustang GT fastback in Raven Black exterior paint. (from page 23 of the 1969 Collection) Raven Black 1969 Mustang GT fastback, front right view.